Our specialty care and critical care teams at AMS act as extensions of the hospital’s intensive care unit and emergency department. When critically ill patients must be transported from one facility to another, our critical care transport team is there to provide uninterrupted continuous intensive care during transport and transfer. These teams bring critical care to patients of all ages from neonatal infants to geriatric patients. Our capabilities include caring for severe trauma to extremely complex medical cases at urban and rural locations throughout the southern United States. Our teams play a pivotal role in the outcome of critical illness by continuing or initiating time sensitive therapies while transporting to the higher level of care destination hospital or a hospital that specialized in a specific injury or illness. SCT and CCT team members have extensive critical care experience as well as lengthy training specific to the transport environment. Nearly every medical intervention possible in the intensive care unit is made possible in the transport environment with specialized equipment and highly-trained personnel. Our management capabilities include intra-aortic balloon pumps (IABPs), left ventricular assist devices (LVADs), active blood product transfusions, complex ventilator management, multiple titrated pharmacological treatments, and neonatal incubators/isolettes. 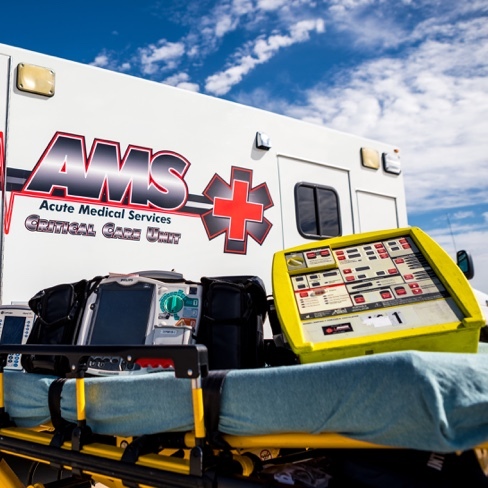 Remote support is given to our SCT/CCT teams through our team of board-certified emergency medicine physicians and critical care intensivists. Utilizing proprietary telemedical platforms, our physicians further extend their reach directly into the ground unit or aircraft. Staff emergency medicine physicians accompany the teams when necessary, providing support for patients who require invasive procedures, complicated medical management, or are at high risk for mortality. For more information about our SCT/CCT teams, please contact info@acutemedical.com.